Find Upcoming Events in our New Events Calendar – Bike to the Sea, Inc. Interested in a spring bike ride or in volunteering to promote bicycling in the region? We now have an events calendar that can help you. 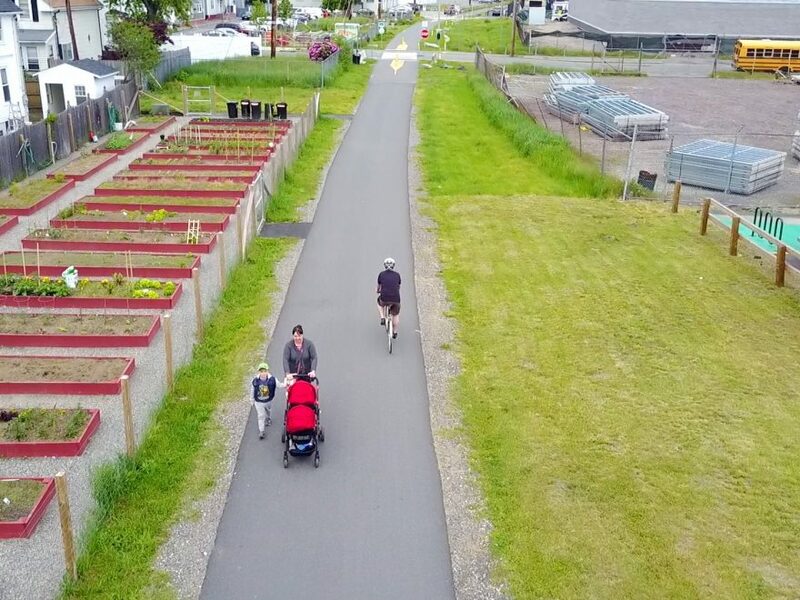 As part of the annual Healthy Melrose Fair, this 13 mile ride will take cyclists from downtown Melrose to the southern end of the Northern Strand Community Trail. Meet at Melrose Bike/Pedestrian Committee Table at Melrose Veterans Memorial Middle School, 360 Lynn Fells Parkway. Steady rain cancels the event. For more information, contact Dan Krechmer at melrosebikerides@gmail.com. Join your friends and neighbors to build Harmon Park Playground. Each of the 3 build days begin at 8AM and end at 4PM, we ask that volunteers stay for the whole day if possible, they can choose 1,2 or 3 days and we provide meals and water. There are so many tasks to complete that volunteers can help with zero lifting to heavy lifting according to their capabilities, however, all volunteers must be at least 18-years old. Don’t miss out on this fun and rewarding experience. As part of the Mystic River Watershed Association’s annual road and boat race, Bike to the Sea, in conjunction with the Somerville Bicycle Committee, has again been invited to lead a ride as part of day’s festivities. The ride will take place along existing paths on both sides of the Mystic River through Somerville and Medford, in addition to the Park at River’s Edge along the Malden River. The ride will also feature the Wellington Greenway as well as the southern-most Bike to the Sea segment in Everett. Plan on a 90 minute ride. Steady rain cancels the event. Meet at Blessing of the Bay Boathouse in Somerville at 11 a.m. for the 11:15 a.m. ride kick-off. The ride from Everett, through Malden, Revere, Saugus, and Lynn to Nahant Beach is designed to bring attention and support efforts to complete the trail. Individual adult registrations cost $25. Family registrations (for two adults and two children) cost $35. Registration includes a free tee shirt and free lunch at the Dockside in Malden after the ride for all participants. Riders can choose a shorter 14-mile course or the full 20-mile route. Route includes both off-road and on-road riding. Police escorts are usually given to assist bicyclists at major intersections. Volunteers are needed. Meet at the Madeline English School, 105 Woodville Street in Everett, at 8:30 a.m. for the 9 a.m. ride kick-off.